Lamb, Rabbit, Tuna, Trout FELIX® pouches are crammed with tender deliciousness. Each fishy and meaty chunk is served in a savoury jelly that cats love, and best of all, they're full of goodness too! All of our recipes contain 100% complete and balanced nutrition for adult cats, ensuring they get everything they need from their diet in order to stay happy, healthy, and full of mischief. We add nutrients including omega 6 fatty acids, vitamins D and E, and a mineral blend to every meal for their health. 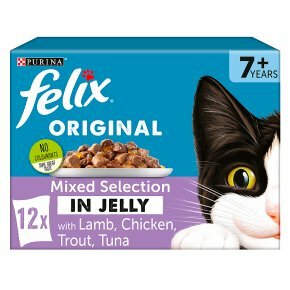 Our Mixed Selection in Jelly includes four brilliant recipes with lamb, rabbit, tuna, and trout - so your cat can take their pick from delicious meat or fish dihes. Irresistible! Irresistible meals for mischief makers. 1005 of your cats daily needs. With antioxidants. Balanced minerals. With proteins. No added artificial flavourings, preservatives and colourants. That's not all! These meals are specially designed for cats aged 7+ with the right combination of proteins, balanced minerals and vitamins including antioxidants to help keep your cat full of vitality. They're packed with healthy goodness and satisfy 100% of your cat's daily needs when served according to the feeding guidelines. Feeding guide For an average senior cat (4kg) 3 pouches per day in t least 2 separate meals Serve at room temperature. Clean fresh drinking water should always be available. The senior maintenance averages are based on moderately active as cats at normal environmental temperatures. Individual need vary and feeding should be adjusted as required to maintain your cat at a lean, healthy body weight.